Homemade Pumpkin Pie is a must on Thanksgiving. 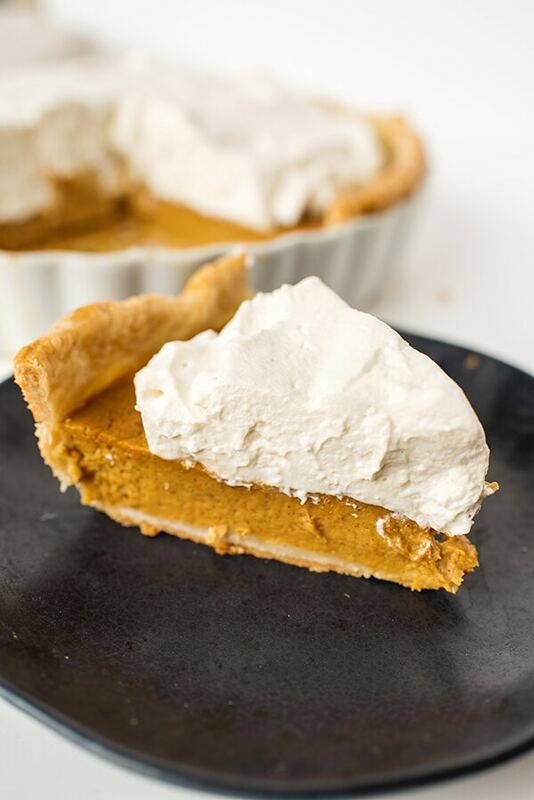 This year, I tried a twist on the classic recipe by creating a Maple Pumpkin Pie recipe topped with Maple Whipped Cream. 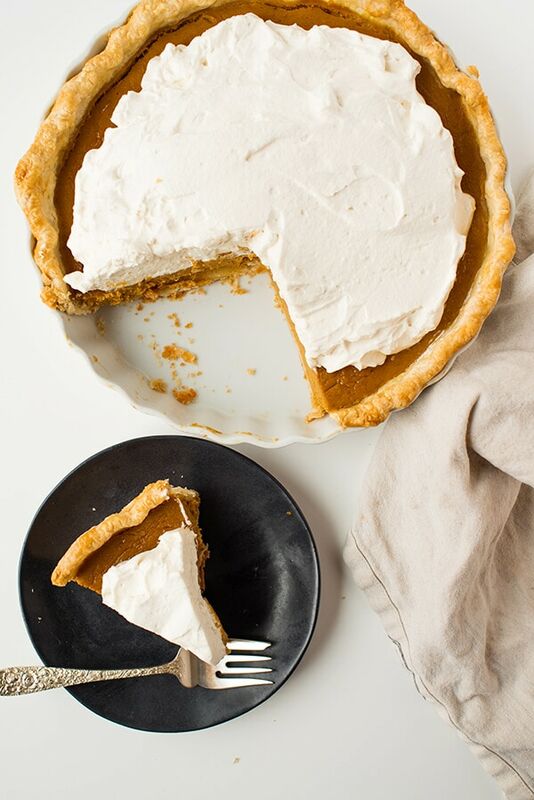 Can we talk about homemade pumpkin pie for a moment? I like pie (though that’s something my under 25 year old self would never have said), but pie totally intimidates me. That whole saying “easy as pie”? Who came up with that? Julia Child? Betty Crocker? Because that is just a bold-faced lie. Pie is not easy. Unless you’re talking about eating it, in which case, yessssss, tell me more. But, to make it, not so much. I spent this past Saturday mostly avoiding making a homemade pumpkin pie. I had made some dark chocolate peppermint energy balls earlier in the day and then procrastinated most of the rest of the day because I knew I had to make a pie (this one in fact), but I did. not. want. to. But Thanksgiving is coming! Homemade pie is required! Right? Right. Sigh. I mean there’s this nice Bread Pudding with Bourbon Sauce you could have or maybe this Apple Pie Bread that has layers upon layers of apple pie filling woven into a cinnamon-bread… or even these Pumpkin Cupcakes with Cream Cheese Frosting… but I know almost everyone’s gonna want a pie. Sigh. Again. So. Pumpkin pie it is. I am not — in case you had not yet guessed — an expert pie maker. But, I wanted to make a homemade maple pumpkin pie topped with maple whipped cream and maybe some pecans. If I pile all this on top of the pie, I’m just going to assume you totally won’t notice how it doesn’t look perfect. Because that’s where pie trips me up. Yummy pumpkin pie filling? Check. Flaky pie crust? Check. Putting them together? Ughhhhh. Because I am not (yet) a homemade pumpkin pie expert and I wanted to make the best pumpkin pie I could… I turned to the pie experts! I read through Bon Appetit’s pumpkin pie recipes and The Faux Martha’s pumpkin pie recipes and Sally’s Baking Addiction’s pumpkin pie recipes, and The Boy Who Bakes’ pie recipes (I don’t think he makes pumpkin pie…). Between all of that research, I cobbled together some general instructions on how to make a flaky pie crust and how to get the whole thing to not be a disaster. In case you think I am overreacting, the first time I made a pie, I set off the smoke alarm because the entire filling overflowed and scorched the bottom of the oven. Once the dinner guests and the hosts spent nearly 15 minutes airing out the kitchen, it turned out the pie itself was pretty tasty. It was a blueberry pie — and I will eventually remake it and publish the recipe. However, homemade pumpkin pie seems to be my nemesis. The first pumpkin pie I made I burnt to a crisp in my parent’s microwave/oven thingadoo. I don’t know why I couldn’t use the regular oven, but on top of making a pie at all, I tried to make a gluten free, sugar-free pie and well the whole thing just ended up looking (and tasting) like charcoal. Into the trash bin it went. Ever since, I’ve only been permitted to use the actual oven. So I guess it was worth the sacrificial pie. The second two I made took me hours. I mean hours. I tried to make a cute squirrel on top and some pretty leaves around the side on one and on the other, I made a ring of leaves and put three leaves in the middle. On that one, I managed to squish at least half the pie crust taking it out of the oven, so that was nice. 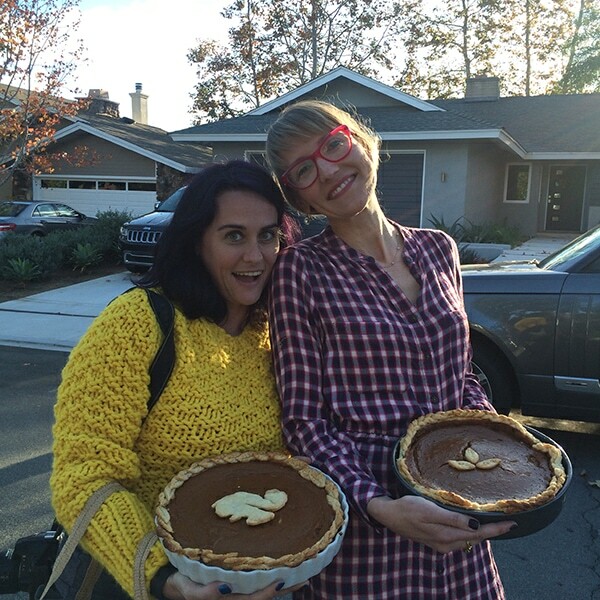 Let’s maybe not discuss the garish, unflattering yellow sweater I’m wearing in this photo and stick to comments about the pie on the right, k? Also, WHY DID I MAKE THE PIE IN A CAKE PAN. So may questions about this one. This time, honestly, though, it wasn’t that hard. I followed The Boy Who Bakes’ recipe for flaky pie crust, which means you’ll have another disc leftover in case you would like to make pretty designs on top – you’ll notice I skipped those this time. Instead, I went with a mound of maple-flavored whipped cream! So there you have it. If I can make a homemade pumpkin pie, you can definitely make a pumpkin pie. And, if you do make this recipe, please tag me on Instagram at @letseatcakeblog! I will share your pie photos in my IG story! This homemade pumpkin pie swaps sugar for maple syrup and is topped with a delicious maple-flavored whipped cream topping! Place flour and salt in a medium bowl and whisk together. Add diced butter and use pastry blender or forks to work until butter chunks are pea sized, but no smaller. Drizzle vinegar and 4 Tbsp. water into mixture. Work liquid through mixture with your hands. Add 1 Tbsp. 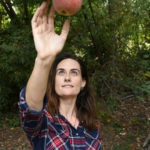 at a time, until mixture no longer feels dry and can be gathered into a ball. Create two equal-sized balls. Flatten each into a disc, and wrap in plastic. If making a top, place both in fridge. Otherwise, place one in fridge for one hour and the other in the freezer to be used for another pie. Place dough on a lightly-floured surface. Roll out into 12" round, turning the dough one-quarter every few rolls. Drape pastry over rolling pin and place in 9" pie pan. Press gently onto the sides and crimp top. Place a piece of parchment inside, fill with pie weights, beans, or rice. Brush outside with beaten egg. Bake for 10 minutes. Remove from oven and set on cooling rack while you make the filling. Whisk eggs and egg yolk in small bowl. Set aside. Heat pumpkin, brown sugar, cinnamon, cloves, nutmeg, ginger, and salt, in pot until hot. Cook for 5 minutes, stirring continually. Remove from heat. Pour heavy cream into pumpkin mixture and stir until combined. Add eggs. Stir until combined. Add vanilla extract and maple syrup. Stir until combined. 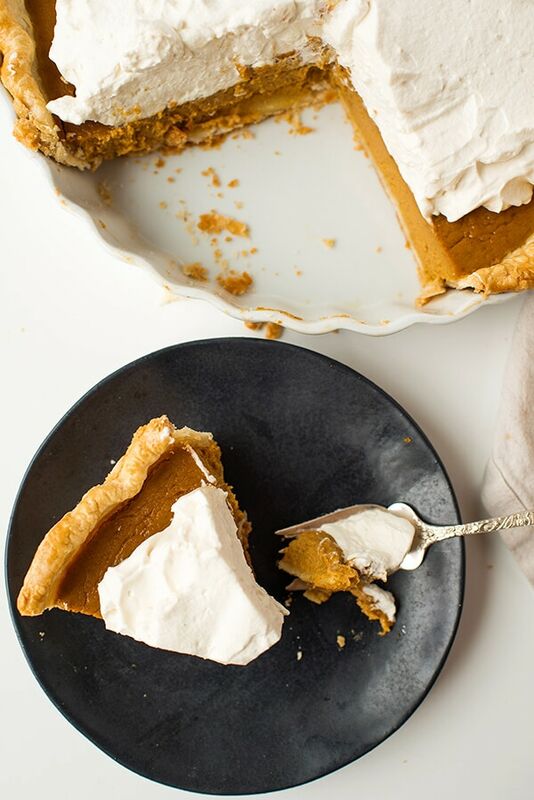 Fill pie crust with pumpkin pie filling. Bake for 25 minutes, then cover edges with aluminum foil or pie guard. Bake for a total of 45-60 minutes, until pie looks dry around edges, crust is golden, and the top jiggles just slightly. Remove and let cool completely. This may take up to 3 hours. Pour heavy cream into mixing bowl. Mix with whisk attachment on high until soft peaks have formed. Add maple syrup. Whisk until soft peaks have reformed. Decorate pie. Soooo good! I’m definitely making this for my family this Thanksgiving! My family tends to like the little pielets instead of whole pie – would I have to change this recipe to adapt it? Thank you!!! I haven’t made mini pumpkin pies before, but Serious Eats had some tips that I’m passing along. I haven’t tested these yet, so I can’t stand by them in the same way I would if I had, but they’re a good source. First, butter your muffin tin — including the top — so your dough doesn’t stick when it rises. For the dough: Roll your dough into a large rectangle about 1/8th inch thick. Cut out circles using a large circular cookie cutter. You might need to use both discs to have enough. Fit these into your muffin tins quickly, making sure to press down in the center and around the sides. Then pop the tin in the fridge to let it cool down as the dough is probably getting a bit warm at this point. Baking: Bake at the same temperature, but for 20 minutes. Then rotate the muffin tin and bake for 5-10 more minutes or until centers look set, pie crust is golden brown, but they still jiggle a little when nudged. I have to confess – pumpkin pies are not my favorite. The part on “How not to make ..” did make me smile. With fresh puree it must taste delicious ! Your recipe sounds fantastic! Loving the maple whipped cream! I have never made one but would really try it!this one looks amazing plus maple cream sound delish! Can you believe that I have never tried pumpkin pie! It’s not really a thing here in the UK. I think this is the year that I need to try it. My problem is always getting that first slice of pie out of the dish without completely destroying it! 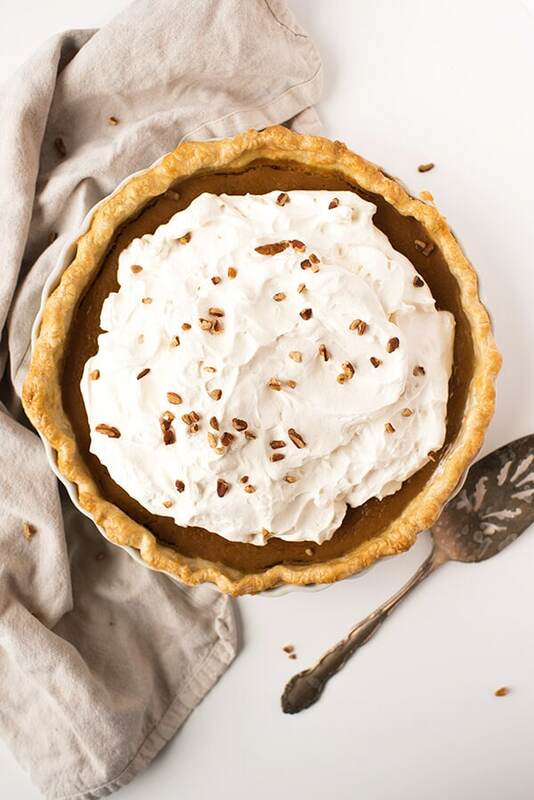 I think your pie turned out beautifully … and I know I would love that maple flavored whipped cream. Place a piece of parchment inside, fill with pie weights, beans, or rice. What does it mean???? I want to try this but I dont understand what it means pie weights or beans or rice??? ?